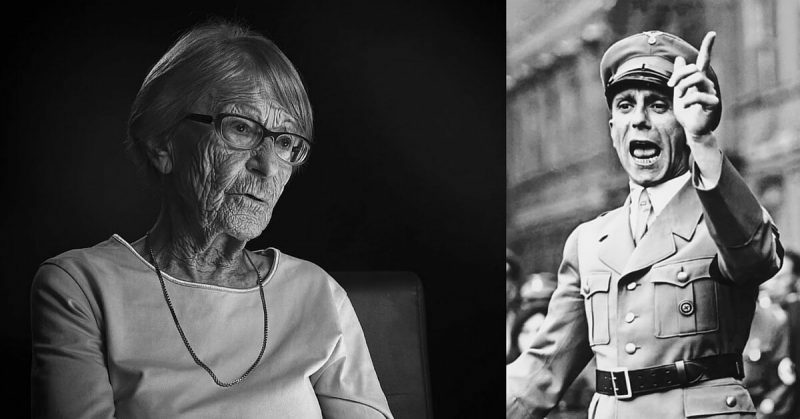 Left: Brunhilde Pomsel Right: Joseph Goebbels. Photo Credit. A German Life (Ein Deutsches Leben) is a German film featuring four directors interviewing Brunhilde Pomsel. Pomsel, 105, was the personal stenographer for Joseph Goebbels, the Nazi Propaganda Minister for the final three years of World War II. The black and white film combines long stretches of the interview with short documentary sequences. The documentary sections include propaganda films and Allied film material showing the liberation of concentration camps. According to Christian Krönes, the directors met Pomsel while working on a different film. She was 101 when they started filming, and they weren’t sure how much time she had left. It took Pomsel a while to begin opening up about her past because she’d been burned by media outlets using only portions of her history and her interviews. Once she was ready, though, she was focused and disciplined for the remainder of the process. It was the first time she had ever opened up so much about her past. 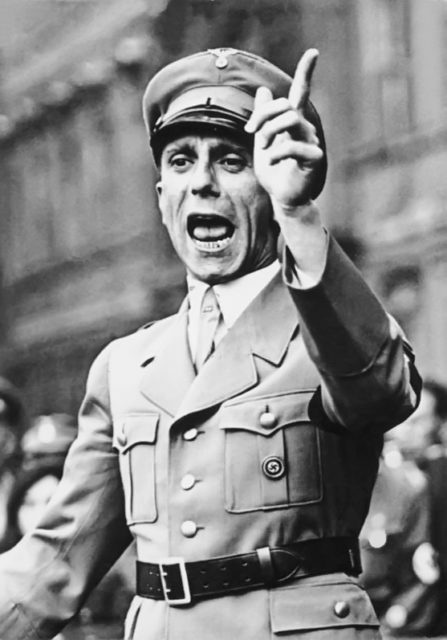 Goebbels giving a speech in Berlin in 1934. This hand gesture was used while delivering a warning or threat. Photo Credit. While Pomsel certainly didn’t tell every story she could have, she did give a witness to her life. When she saw the final product, she stated that it is important to hold up a mirror at the end of your life to recognize the mistakes you have made. While Pomsel switches between “refusing blame” and “confessing”, she is echoing the way millions of Germans felt after finding they had supported a system like Nazism. In that sense, the film is timeless. The financial crisis and influx of refugees that led to the rise of the Nazis are not much different from the current economic crisis, waves of refugees, and increase in far-right parties in government. The difference now is that it’s not just one country experiencing this, it is the entire European continent. In the film, Pomsel is not emotional while discussing the deaths of the Jews or other victims of the Nazis. However, she does get emotional talking about the deaths of Goebbels’ children and also about the execution of Sophie Scholl. This shows her concern about individuals while she masks from herself the bigger picture of what was happening. The film’s style is designed to remove it from time and place. There is no commentary because the directors were worried about their film becoming another piece of propaganda. They simply allow Pomsel’s story to be told. In the end, the film highlights something of which so many were guilty – they ignored the signs and pretended they couldn’t see the horrors inflicted on others by their leaders.